By Scott Gilfoid: Joe Joyce (7-0, 7 KOs) will be facing former WBC heavyweight champion Bernane Stiverne (25-3-1, 21 KOs) on February 23 on the undercard of James DeGale v. Chris Eubank Jr. at the O2 Arena in London, England, according to @BaylorICTV. This will be a good test for #9 WBA Joyce to show the boxing world what he’s got against a fighter that Deontay Wilder beat on two occasions. This is definitely a considerable step up for Joyce from the 2nd and 3rd tier opposition that he’s been feasting on since he turned pro in 2017. Stiverne may not be anywhere close to the fighter that he once was, but he’s still leagues above the fodder that Joyce has been mowing down since he turned pro. It’s not Joyce’s fault that guys like Dillian Whyte, Jarrell ‘Big Baby’ Miller and Dereck Chisora. If those guys had stepped it up to fight Joyce, we would have seen how good he is a long time ago. Stiverne is a good fighter when he’s in shape. In his last fight, he was overweight at 254 pounds against Wilder in November 2017. That was well above the 239 lbs he weighed for his first fight against Wilder in November 2015. What Stiverne had going against him in his rematch with Wilder wasn’t just the weight. Stiverne hadn’t fought in two years since 2015 when he stepped inside the ring to fight the in shape 6’7″ Wilder, who had been very busy with his own career since beating him two years earlier. The combination of ring rust and weight was too much for Stiverne. He had no business fighting Wilder with that much ring rust and an extra weight on his frame. What could hurt Stivern’s chances of beating the younger 33-year-old Joyce in this fight on February 23 is the fact that Bermane hasn’t fought since his loss to Wilder in November 2017. When Stiverne steps foot inside the ring to fight the 6’6″ 260 pound Joyce on February 23, he’ll be coming off of a 15 month layoff. That’s a long, long time to be out of the ring. You can’t count Stiverne’s fight against Wilder in 2017 as helping him stay sharp. Joyce has looked pretty impressive recently in destroying Joe Hanks Jr., Iago Kiladze, Ivica Bacurin, Lenroy Thomas, Donnie Palmer, Rudolf Jozic and Ian Lewison since turning pro in October 2017. Those were mostly early knockout wins for Joyce, who was unquestionably robbed in the final of 2016 Olympics in his fight against Tony Yoka of France. Joyce clearly deserved the win over Yoka, who took a beating in that fight. This fight doesn’t look like it’s coming at a good time for Stiverne. 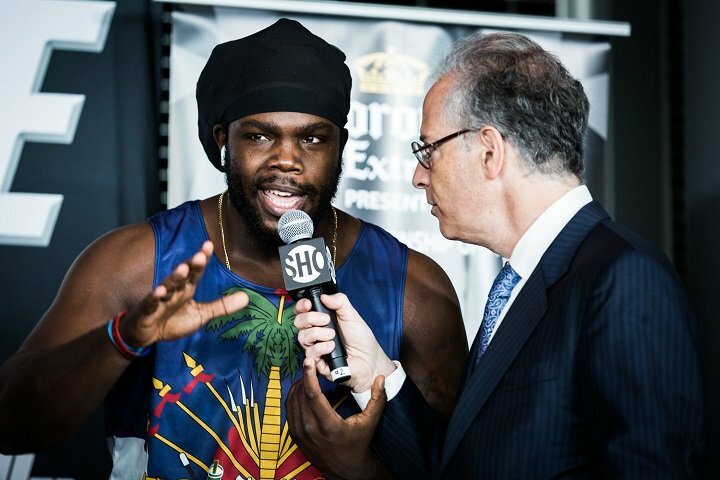 To take on the ‘Juggernaut’ Joyce, Stiverne would need to have his stamina and weight under control, and it’s questionable whether he’s going to be in the kind of shape that he’s going to need to be for him to have a chance of winning this fight. We know that when Stiverne was at his best back in 2013 and 2014, he was more than a handful in beating Chris Arreola twice. Stiverne was powerful in this fight with a great jab, a nice left hook, and a short right hand that he could throw with power. That version of Stiverne would be a problem for Joyce, but it’s unclear whether age and inactivity has gotten the best of him. When a fighter has been as inactive as Stiverne has in the last four years, they generally don’t come back from it to be the fighter they once were. Muhammad Ali, Vitali Klitschko and George Foreman were rare heavyweights that were able to come back after a long layoff to still compete at the highest levels. But those were different fighters than the short 6’2″ Stiverne. He’s not as powerful or as tall as Foreman and Klitschko. Stiverne doesn’t have Ali-like boxing skills going for him. Stiverne is going to need to be in very good shape for him to hang with Joyce on February 23, and it doesn’t seem like he’s going to. Hopefully for Stiverne’s shape, he can come into the fight in the best shape of his life to give Joyce a run for his money. The fight could be an interesting one if Stiverne is able to stand and trade with Joyce to get him into the later rounds. The prime version of Stiverne, would take Joyce deep into the fight and possibly knock him out. Too much time has gone by for Stiverne, and he took a lot of punishment from Wilder in his two fights with him, especially the first one in 2015. Wilder landed a lot of heavy shots in that fight that Stiverne was forced to take. He took the punches well, but they couldn’t have helped him. There were recent rumors that Joyce ran Tyson Fury out of camp with his hard sparring at high altitude at Bear Bear, California, while helping the lineal champion prepare for his title shot against World Boxing Council heavyweight champion Deontay Wilder on December 1. Fury was supposed to stick it out at Big Bear right up until the fight, but he bailed from camp, coming back down to sea level to train at Freddie Roach’s gym in Los Angeles, California. Was it because of Joyce working Fury over that he left early? Only Fury knows. Former IBF super middleweight champion James DeGale (25-2-1, 15 KOs) has a really tough fight ahead of him against the 29-year-old former IBO 168 lb champion Chris Eubank Jr. (27-2, 21 KOs) in the headliner fight on February 23. This is going to be a really fun fight for as long as it lasts. If DeGale looks as shot as he did in his two fights against Caleb Truax, he’s going to get quickly found out. This could be the end of the line for DeGale. The excuses end here. DeGale was able to make excuses for his two poor performances against Truax by blaming it on him still not 100 percent due to his shoulder surgery, but it’s now been two years since the surgery. As such, if DeGale gets his backside handed to him by Eubank Jr., which is a very real possibility, then the only thing he can blame it on is him being a shot to pieces fighter, who needs to call it a day. Of course, DeGale can do whatever he wants with his career. Perhaps he can hustle a fight with George Groves, but it would be kind of pathetic though. What boxing fans will want to see DeGale and Groves fight each other with both of them coming off of losses? Maybe there will be some boxing fans that will still want to see Groves and DeGale go at it no matter how the two of them looked in their previous fights. It would be similar to the Amir Khan vs. Kell Brook fight. If Khan comes into the fight with Brook after being knocked out by Terence Crawford on April 20, it’ll be a test to see how loyal his fans are in still wanting to see him compete against Kell. For Brook’s part, he hasn’t had a real fight since his loss to Errol Spence Jr. in 2017. Brook’s two fights since then have been embarrassing mismatches against Michael Zerafa and Sergey Rabchenko. Now there’s talk of Brook fighting Jessie Vargas on April 6. Vargas hasn’t won a fight in two years. So it’s possible that even if DeGale gets wiped out by Eubank Jr. on February 23, boxing fans will still want to see him and Groves do it again in a glorified old timer’s fight.